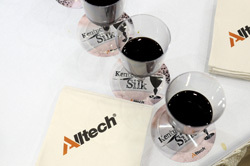 It’s called “Kentucky Silk” and it’s another innovation from Alltech. This stuff will get you going in the morning, or evening, or whenever. This morning as we arrived at the Convention Center for the Alltech Symposium we had sample. It’s a bottled product and contains bourbon and coffee. Basically you pour some in a cup, add hot water and top it off with some cream on top. It is good. The photo is contributed by Alltech photographer, Tim Webb.